Healthy Inside ~ Fresh Outside..!! : How Long Does Coffee Caffeine Stay in Your System? How Long Does Coffee Caffeine Stay in Your System? Coffee is so popular that is only second to oil as a source of foreign exchange, according to the Coffee Science Information Centre. Coffee is consumed abundantly and valued by many. Besides savoring the bold, rich taste of freshly brewed coffee, many people consume it for its caffeine content. A hot cup of coffee in the morning to get you going, and a cup of coffee in the afternoon to keep you going, are often the job of the beverage--delivering caffeine reliably throughout the day. Coffee has been around for thousands of years, but may have been used originally as a food, as opposed to the popular beverage of today. Coffee beans may have originated from Kaffa, today known as Ethiopia, according to the Coffee Science Information Centre. Drinking coffee first started in Mecca, but became popular throughout the Arab world shortly thereafter. Coffeehouses opened in Mecca, then in Dutch colonies and eventually in Venice. They were favorite meeting places for social or business affairs. More recently, coffee has been touted as a potentially healthy drink. The coffee tree, native to Africa, usually has two beans in each fruit. The fruit of the coffee tree looks like a red cherry. The two species that are cultivated are robustas and arabicas. Arabicas require little water, grow at high altitudes and have less caffeine than robustas. When the coffee tree is three to five years old, it begins to produce fruit, which is then harvested. The outer layer of the bean is removed to reveal a dry, green coffee bean. The beans then are processed in order to be exported around the world. 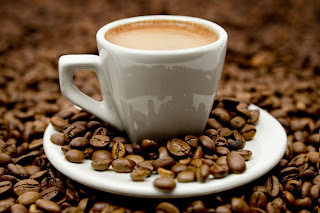 Caffeine is the most widely consumed active substance stimulating the central nervous system, according to the Coffee Science Information Centre. It belongs to the alkaloid family and can be found in over 60 plant species--cocoa beans, tea and coffee being the most popular. Caffeine can have a positive or negative effect on mood, mental performance and sleep. It does not accumulate but is distributed throughout the body shortly after it is ingested, according to the International Coffee Organization. Caffeine is fully absorbed by the digestive system in approximately 45 minutes, according to the Coffee Science Information website. Typically, the peak of concentration is 15 to 120 minutes after caffeine is consumed. Caffeine stays in the bodies of men for five to nine hours, but the amount of time is reduced by 30 to 50 percent in smokers. The length of stay for caffeine in women using oral contraceptives is approximately 12 to 15 hours, and can be as long as 15 hours in pregnant women as well, according to the Coffee Science Information Centre and the International Coffee Organization. The caffeine in coffee may cause unwanted side effects. Too much caffeine can cause insomnia, nervousness, restlessness, irritability, nausea, irregular heartbeat, muscle tremors, headaches or anxiety, according to the Mayo Clinic. The effects of caffeine are different for everyone, as is the amount of caffeine that may cause these problems.